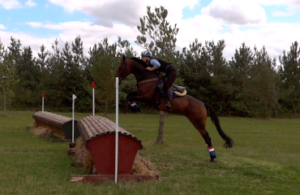 “I suppose I have to admit that I’m a ‘mature’ event rider, at 45, eeek. I still feel about 22, so I hope I can be excused! 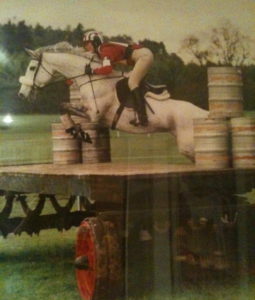 But I can’t escape the truth, I have been eventing since 1988, on my first horse. I’ve been lucky enough to go to some great trainers in the ensuing years. I was a Working Pupil for Leslie Law and his fiancée Harriet Harrison, then trained for some years with Nick Burton, now an Olympic-level Ground Jury Member and dressage judge. 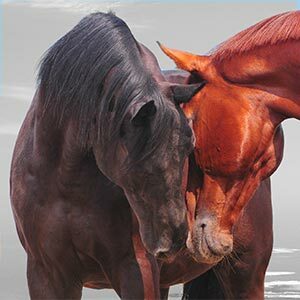 I have attended many clinics since then and always try to learn something new to add to my ‘toolbox’ for training horses and improving my riding. My long-term trainer is Herr Eberhard Weiss, who comes over from Germany to teach in England every so often. He is incredibly kind, patient and rigorous, very strict about the rider (which I appreciate) and always knows exactly what exercise a horse needs to do at a given time to help it improve. I love his way of teaching and am a totally devoted disciple! I’ve been lucky enough to have some super horses over the years, all self-produced, and the aim has always been the dizzy heights of 4*, but the furthest I have managed so far is 3*. 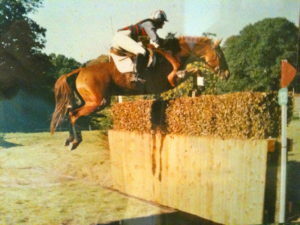 This was in the old long-format days, with a fantastic mare, Skylarker (Doris), who was previously showjumped. She was always very difficult on the flat but jumped for fun and we got placings at Advanced. Unfortunately she developed a cataract and, guttingly, had to be retired after our clear at 3* level (although we’d fallen on the flat between fences so had a huge number of time penalties). to get to the top the hardest way! My latest hopeful is Daisy (The Opposition Rose), out of an Irish jumping mare and by the legendary Fleetwater Opposition. She is 9 now, and is opinionated and not always easy, but I still have a lot of faith that she is hiding her light under a bushel and actually has a lot of talent in there, and that bigger fences will bring her into her own. She is just about ready to step up to Novice level, as she is finding BE100 (Pre-Novice) very easy now, but has just had some time off for scans and treatment, as she has an old injury to her supraspinous ligament, which runs along her back. I had had a nightmare finding a saddle she would truly accept, but WOW saddles (blog post here if you want to see it) came to the rescue and have been a revelation to both of us. Hopefully she will be more comfortable now and we can get out Eventing again and have some fun, without the tension. Ellie is the same age as Daisy, but was struck down by a mystery illness over 2 years ago which gave her temporary heart problems, and ongoing ataxia. She is finally sound again, so I will be trying to start her again and seeing how she goes. Ideally I would like to have her on Calmer as she was naturally very flighty and has unfortunately regressed due to feeling insecure due to her ataxia, I think.I also have Jinni, a chestnut homebred out of Katy Jones (ex-racer who I evented to Novice but unfortunately she just wasn’t tough enough) by legendary Irish stallion Jumbo. Jinni is rising 3, and HUGE. Unfortunately she nearly killed herself mucking around in the field as a yearling (her story and pics are here). She is definitely going to need some Calmer for backing, I think, as she’s now big, strong and definitely has her own ideas, and unfortunately lacks the manners I should have been able to put into her when she was younger, but I couldn’t as she was so compromised due to her brain and neck injuries and her ataxia. Personal stuff: I have my own private yard with 5 horses (4 of them mine, 1 aged companion pony for Jinni), 6 dogs, countless chickens, various rescues, and a very tolerant non-horsey (but learning fast) wonderful boyfriend. I absolutely love Eventing, I am a complete devotee of the sport and have worked behind the scenes for a few years for the Event Riders Association, which strives to give the riders a voice and to help improve the sport for all. ERA has 4,600 Likes on Facebook, and over 10 700 Twitter followers, and members from 4* riders to Grass Roots level. I absolutely love Eventing, I am a complete devotee of the sport and have worked behind the scenes for a few years for the Event Riders Association, which strives to give the riders a voice and to help improve the sport for all.